The Ritz-Carlton Istanbul is a stunning luxury respite for travelers to Istanbul. The hotel opened in October 2001 and has been pampering its guests ever since. Located on a hilltop in the prestigious Dolmabahçe area, the hotel has dramatic panoramic views of the Bosphorous Straits, and features Murano chandeliers, exotic floral displays, gleaming marble inlaid floors, Turkish antiques and carpets, as well as original oil paintings throughout the hotel by the famous modern Turkish artist, Timur Kerim, that help to create a sumptuous ambience. Guests receive a gracious welcome from the Reception staff with bowls of Turkish delights at the reception desk, and guests entering the hotel in the afternoon will be greeted by strains of violin and piano music in The Lobby Lounge during Afternoon Tea. The Ritz-Carlton Istanbul has 244 deluxe rooms, which include 21 Executive Suites, 57 Club Rooms, and 2 special suites, The Bosphorous Suite and The Ritz-Carlton Suite. The hotel has barrier-free accessible rooms, their Fitness Center is open 24-hours, their indoor pool features a "starry sky" and an aquarium, and their Laveda Spa offers traditional Turkish Hamam, as well as innovative treatments including Shiatsu massage, Sacred Stone Therapy, and body and facial toning machines. Edward F. Nesta and I stayed at the hotel in March 2006, and were impressed with the level of attention to detail by the hotel staff. We stayed at The Ritz-Carlton Club ® on the 12th floor of the hotel, where our corner room had a wall of windows that offered us spectacular views of the Dolmabahçe Mosque and the soccer stadium, which would have provided us with ‘sky box' viewing had there been any games during our stay. It would have been quite exciting to watch the game from the window of our room, but we enjoyed watching the boats on the Bosphorous straits, which divides Europe and Asia. Istanbul is the only city in the world that is located on two continents. Our room was the epitome of luxury, with a beautiful bouquet of white stock and calla lilies in the foyer, the king bed was lushly adorned with a fluffy white goose down duvet, six large square pillows, and was adorned with a red and gold embroidered pillow that matched the bedskirt, and there was a bench covered with red fabric placed at the foot of the bed. Above the bed, there was exquisite gold and green framed embroidery, and limited edition signed lithographs hung on the bedroom and bathroom walls. We enjoyed relaxing in the comfortable red and gold chair dressed with gold and red pillows, with our feet up on the ottoman, planning our Spa treatments or reading the interesting assortment of magazines on the table next to the chair. 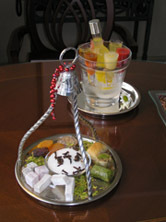 We loved returning to our room each day to find a special surprise on the large desk, where one day we found copper covered bowls that held the famous Turkish hazelnuts and dates, and on another day a tray there was a "hookah" that was filled with chocolate sticks and assorted chocolates and Turkish delights. There was ample closet space, a large safe, umbrellas, and mini-bar, high-speed wireless Internet access, an AM/FM clock radio, large Philips television, and multiple telephones located throughout the bedroom and bathroom. 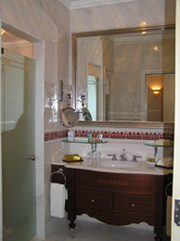 The spacious white marble bathroom featured gorgeous white, red, blue and green Ĭznik design floral composition tiles, there were silver sconces on either side of the large silver mirror above the vanity, a shaving/vanity mirror and a white lily with baby's breath in a white vase added elegance. There was a was a beige, dark green, blue and red geometric design carpet on the marble floor, a walk-in shower, deep soaking tub with an elegant Ottoman-inspired marble backdrop with another large mirror above the tub, and an enclosed toilet. The hotel clearly paid extra attention to their wide assortment of luxury toiletries, which also included The Ritz-Carlton Istanbul collar stays, two fluffy terrycloth robes and two cotton robes, slippers, hairdryer, bath oil in a "genie" bottle, and three types of bath salts in little bags in a covered glass container stood at the ready at the edge of the tub. During our stay at the hotel, we pampered ourselves at their Laveda Spa, had sumptuous dinners at their gourmet Çintemani Restaurant where Executive Chef Fabrice Canelle has created special Gentleman's and Lady's menus, enjoyed creative cocktails with their award-winning Bartender, Cevat Yildirim, and listened to live guitar music in the evening at the RC Bar, had decadent Afternoon Tea in The Lobby Lounge, and inviting snacks throughout the day in The Ritz-Carlton Club ®. We explored the hotel's lobby shops as well the shops at the Süzer Plaza Shopping located an elevator ride away. The Ritz-Carlton Istanbul is conveniently located within walking distance from shopping and many of the major sights or is only a short ride by car. We thoroughly enjoyed exploring Istanbul from the comforts of our Istanbul "home away from home." Please read our articles on The Ritz-Carlton Istanbul in the Destinations, Chefs' Recipes, Restaurants, Spas and Liquor Cabinet sections.